We have been learning about Matariki and the constellation. Matariki is a small cluster of stars and it is also known as Plieades. There are several hundred stars but only seven of them can be seen. Matariki is a traditional Maori New Year. 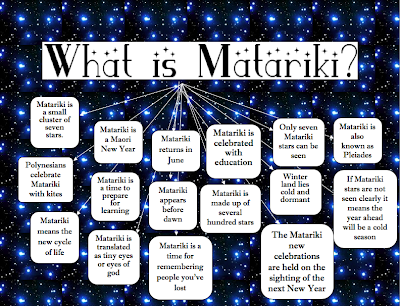 Matariki is celebrated with education and sharing ideas. Matariki is a time for remembering people you've lost.